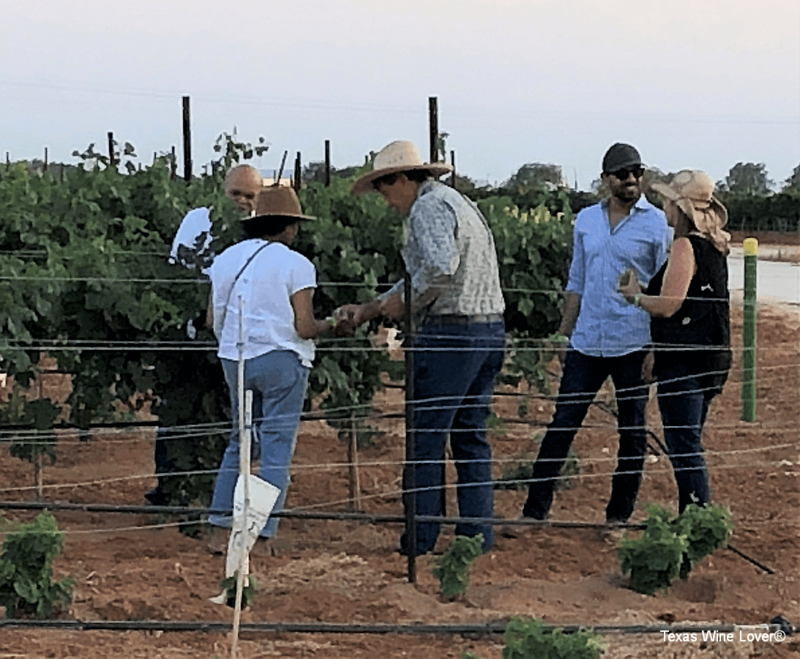 Parts One and Two of Texas High Plains Vineyards posted earlier, covered many of the key reasons why about 85% of Texas wine grapes are grown in the Panhandle area of Texas, mostly southwest of Lubbock, and described some informative visits with several top grape growers in Texas. 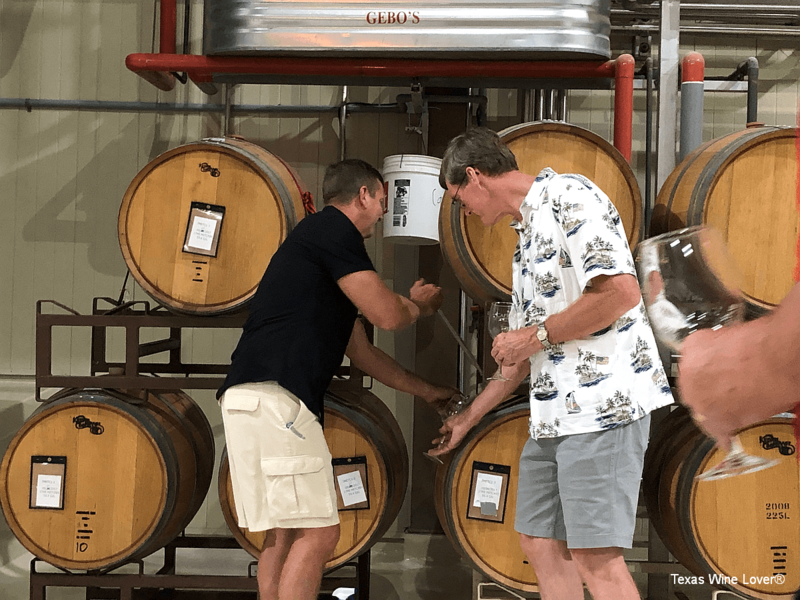 This third part covers visits with more key growers and winemakers during a wonderful five-day adventure with friends Laurie and Shelly Ware in early August, 2018, just as the season’s harvest had begun. Our final two days on the High Plains were spent visiting friends in and around Brownfield and Lubbock. Saturday morning again greeted us with bright sunshine and that seemingly never-ending West Texas breeze. First up this morning was a visit to Whitehouse Parker, the tasting room for Farmhouse Vineyards. We drove just a short distance south of Brownfield to the white house with a welcoming sign and mechanical grape harvesting machine parked out front. This was a first for me. I had never visited a tasting room with a harvester (for sale, by the way) parked at the entrance. We entered and were immediately greeted by the Farmhouse Vineyards team, Katy Jane and Nicholas Seaton and Traci and Anthony Furgeson. After greetings and hugs all around, we began a brief tour of the newly repurposed and beautifully decorated house. The front room contained tables for tastings, and a lot of fun farming artifacts as well as many neat items for sale. Katy Jane never seems to miss an opportunity to provide her visitors with something fun to look at and give you a shopping experience to boot. The second room had a tasting bar and many more fun things to view. Behind the bar area was a beautifully decorated bedroom that I believe is sometimes used for guests or late-night workers that need a place to crash. Two rooms at the back of the house were set with tables for relaxed wine tasting experiences. Outside the back door was a very pleasant tree-shaded patio with tables and a vineyard view to the south. We gathered at a table and began to enjoy several wines while discussing the vineyards and upcoming harvest. 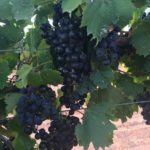 Anthony and Nicholas shared a lot of information about their vineyards, the 2018 growing season, and the High Plains in general. We then loaded into an ATV with Katy Jane and Nicholas for a vineyard tour. Traci and Anthony stayed behind to greet other folks scheduled for a visit that morning. As Nicholas drove us along, we could see how the vineyard rows rose and fell with the contour of the land. 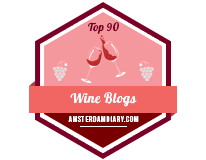 There were definite high and low spots in the vineyards, and Nicholas pointed out how the overall vigor of the vines varied based on their high-low position. None of us could conjure up a good reason, but one has to assume that Mother Nature has a plan and must know why. (?LOL?) The vineyards were in beautiful shape, clearly showing the hard work that had gone into maintaining them through the spring and summer. The grape clusters were beautiful, signaling a good harvest to come. 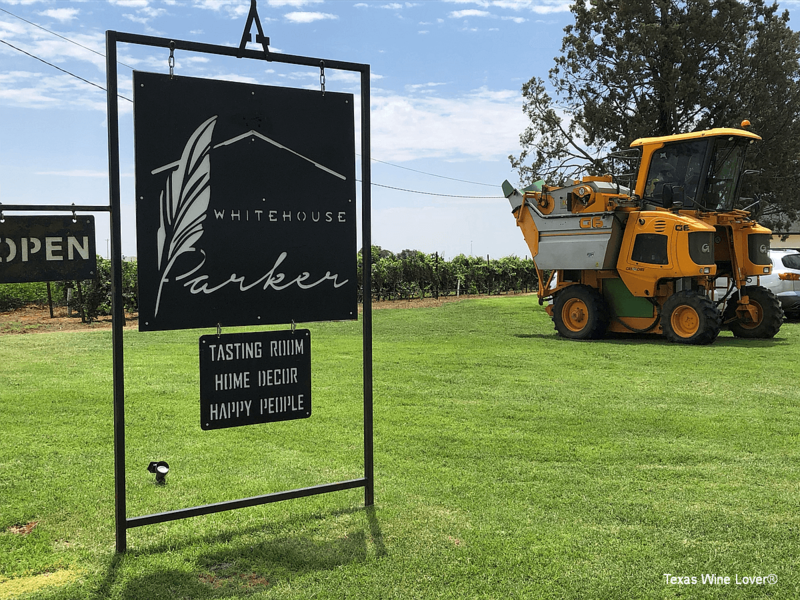 We returned to Whitehouse Parker for more tasting and visiting. The time just slipped away, and we soon realized it was time to move on to our next visit. It is so hard to say goodbye to great friends like Katy Jane, Nicholas, Traci, and Anthony. 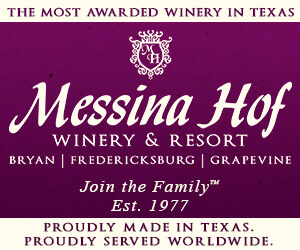 These are wonderful folks and good farmers dedicated to supporting the Texas wine industry. Special thanks to the Farmhouse Vineyards crew. 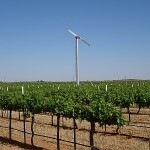 The next stop was CapRock Winery, southeast of Lubbock, to visit Steve and Cindy Newsom. 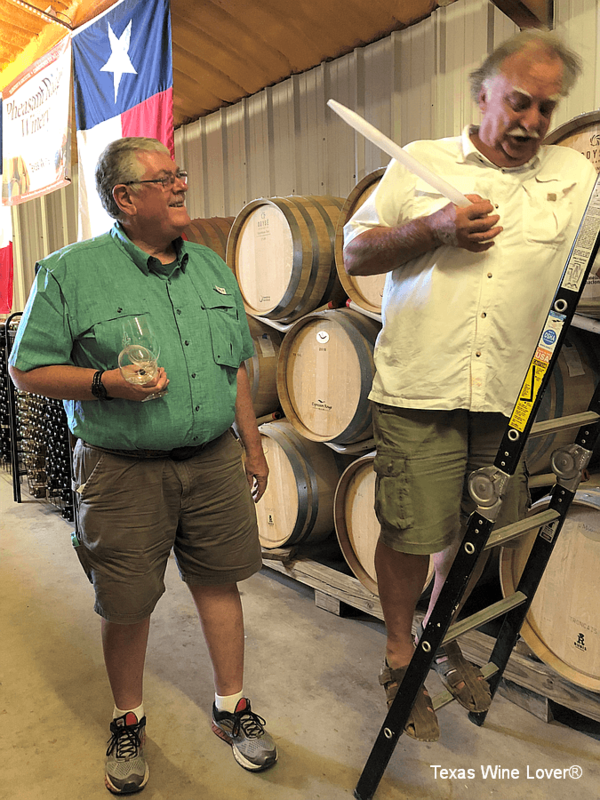 Steve has taken over winery operations at CapRock and begun to dissolve his partnership in Trilogy Cellars in Levelland. CapRock has gone through a lot of issues over the years, ever since its original incarnation as Teysha Cellars in the 1980s. 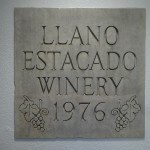 Several different owners have made attempts to improve the wines and overall operations, but so far it has been difficult. 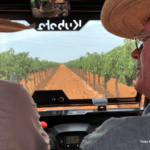 Steve and Cindy are dedicated to the task of remaking CapRock, building a far more positive image, and providing much better wines for the future. We have faith in them and offer our support and encouragement to these special friends. We entered the impressive facility and found Steve and Cindy at the tasting bar. Two staff members were pouring CapRock wines and newly-labeled English-Newsom wines, representing the current CapRock partnership between the English & Newsom families. Also, at the tasting bar was an old friend of mine, actually a fraternity brother from McMurry College (now University) in Abilene, Dayvid Cole, and his wife, Gyna. It was so much fun to meet Gyna and connect with Dayvid. We had not seen each other since graduation in 1972. We visited for a while at the tasting bar, telling stories and remembering experiences. 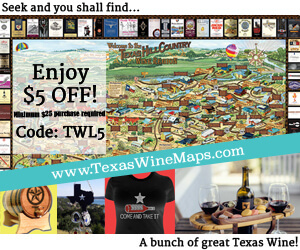 It was interesting that both Laurie and I had been investors in Teysha Cellars. Somehow Laurie got her original investment refunded out of their bankruptcy, but I did not. That was just not fair, right? Oh well. Steve began telling us how he and Cindy decided to leave Trilogy and take on the CapRock challenge (a story for another time). He took great pride in describing future plans for the winery, including upgrades to winemaking and, most likely, a new name. We all took turns offering suggestions, but I’m sure Steve and Cindy will come up with one better than those we offered. Steve led us through the spacious barrel/event room to the winery filled with glistening stainless-steel tanks. Several upgrades were in the works, including improved drainage and flooring to make sanitation an easier task. We eventually settled at the back of the first tank room where a long row of oak barrels was positioned. These barrels contained Cabernet Sauvignon and Merlot from Steve and Cindy’s vineyards near Levelland, part of their departure agreement from Trilogy Cellars. 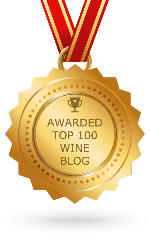 We excitedly tasted Cabernet Sauvignon from barrel – delicious. We then tasted the Merlot, also delicious, followed by Steve blending the two wines in our glasses. The blend was even better. This was fun! Steve led us into the second tank room where more barrels filled with Malbec from Levelland lined a wall. 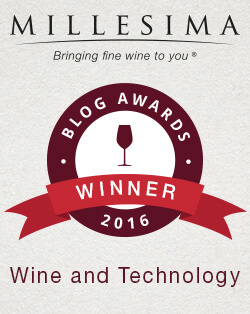 We tasted the Malbec, again declaring its delicious characteristics. Then Steve set about to make a blend of all three Bordeaux varieties for us to taste. WOW! This is going to be a really good wine! We all visited more about Steve and Cindy’s plans for the winery, and Dayvid and I also did some catching up. Eventually we trooped back through the winery, picked up some bottles at the tasting bar, and settled into comfortable outdoor seating under the arbor on the west side of the building. A lot more visiting ensued as we watched the sun ease downward to the west. It was so much fun sharing with these special folks. Dayvid and Gyna left to go home for dinner, and that brought up the question about our own supper plans. Steve and Cindy offered to join us for Italian food in Lubbock, an offer we readily accepted. The restaurant on 82nd Street (can’t remember the name) was a good place for our group. We ate delicious food, shared some nice wines, and made a notable impression on our young wine server. She was a bit uneasy opening bottles for us as she recognized our backgrounds and levels of connection with the Texas wine industry. Her corkscrew was not the “double-jointed” type I prefer and caused her to struggle removing the corks. I pulled my Farmhouse Vineyards’ corkscrew from the leather holster that always hangs on my belt, gave it to our wine server with a quick suggestion or two, and then sat back as she easily opened our last bottle for the evening. We could not help but be amused as she ran back to her colleagues to show them her new corkscrew and share her experience with the “wine crazies” at the big table. We finally had to say goodbye to Steve and Cindy, thanking them profusely for their time and hospitality for the afternoon and evening. 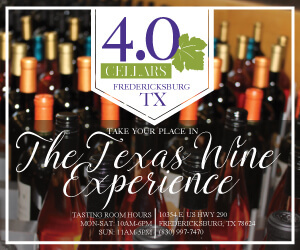 We loaded up in Shelly’s Tundra and headed back to Brownfield since we were expected at the second night of the Terry County Grape Capital of Texas Vineyard Festival at the Reddy Vineyards events barn. We saw an interesting sight in the vineyard as we drove up to the building. 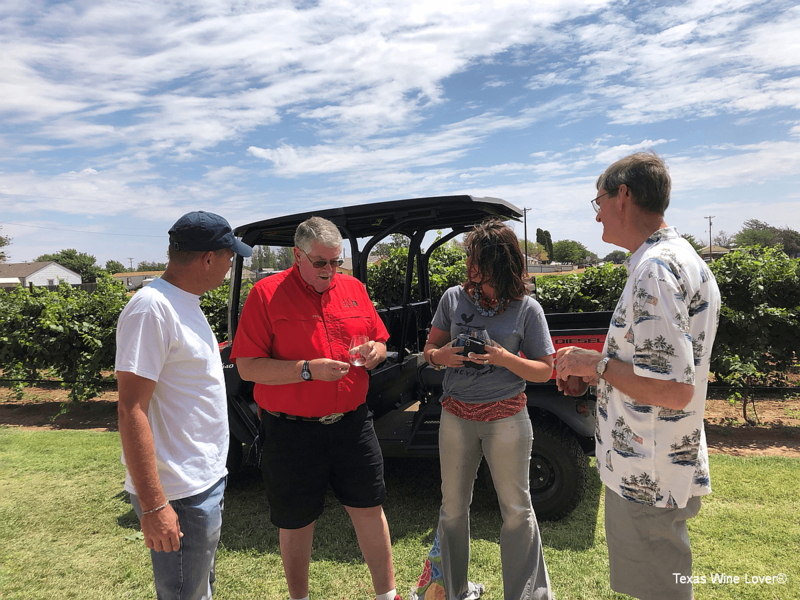 Neal and Janice Newsom, along with Subada and Vijay Reddy, were standing near some vines tasting grapes. We stopped to join them and found out the discussion was about what variety of grape was planted in these final rows. It was a mystery to Vijay as he had instructed his vineyard crew to plant extra vines of several varieties not used in the main vineyard here, near the events barn. We all stood around, tasting and discussing, and decided the grapes were probably either Roussanne or Viognier. Several clusters were taken inside and shared with other growers, and it just seemed funny that it took a while to reach a consensus that the grapes were (most likely) Roussanne. We still chuckle about this experience with many of the best growers in Texas. Although we arrived late at the events barn, we learned that supper was delayed since the afternoon vineyard tours had not yet returned. We joked about the buses getting lost since the guys driving and hosting the tours were actual Terry County grape growers. Finally, the buses returned, dinner was served, and a music group tuned up to provide some most pleasant, low volume music for our evening entertainment. Much like the previous night, we focused on connecting and visiting with special friends, including: the Wilmeth clan, Gay and Jet, Mary and Ty, Michelle and Kevin Hart, Bill and Gail Day, Jeremy and Bree Nelson, Katy Jane and Nicolas Seaton, Traci and Anthony Furgeson, Madonna and Tony Phillips – you get the idea. 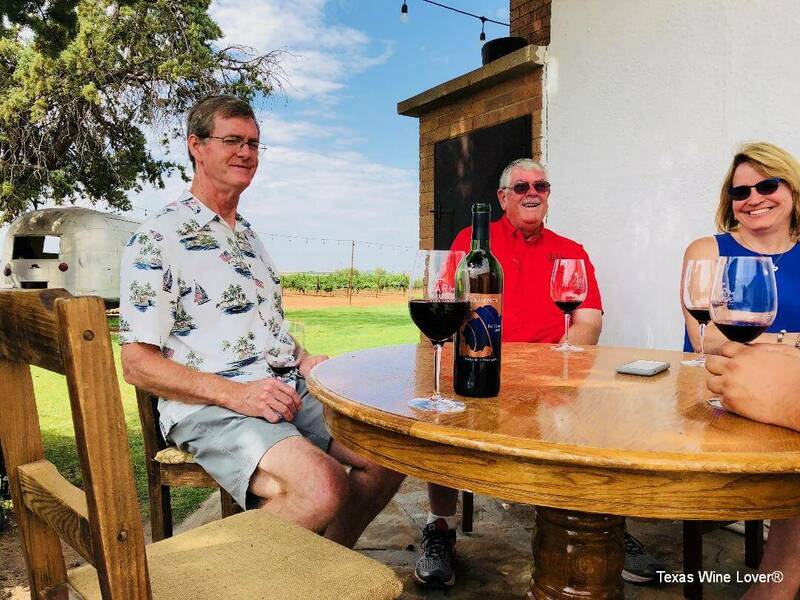 The five wineries serving tastes and glasses of wine included: Llano Estacado, Bingham Family, Burklee Hill Vineyards and Trilogy Cellars, Bob Landon of Landon Winery, and Farmhouse Vineyards. 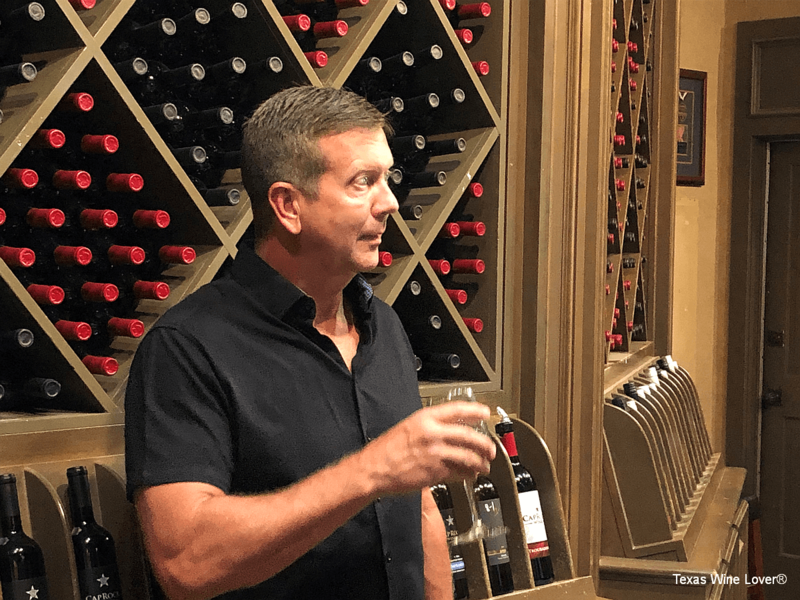 Andy Timmons of Lost Draw Vineyards and Cellars gave a fitting tribute to his recently departed cousin, Buzz Timmons, and provided a blessing for the dinner as well as the upcoming Texas High Plains grape harvest. 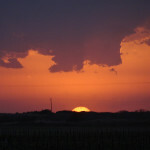 And thus, another wonderful and fun wine day on the Texas High Plains came to a close. A special visit was planned for Sunday with Jennifer and Bobby Cox at Pheasant Ridge Winery in New Deal. 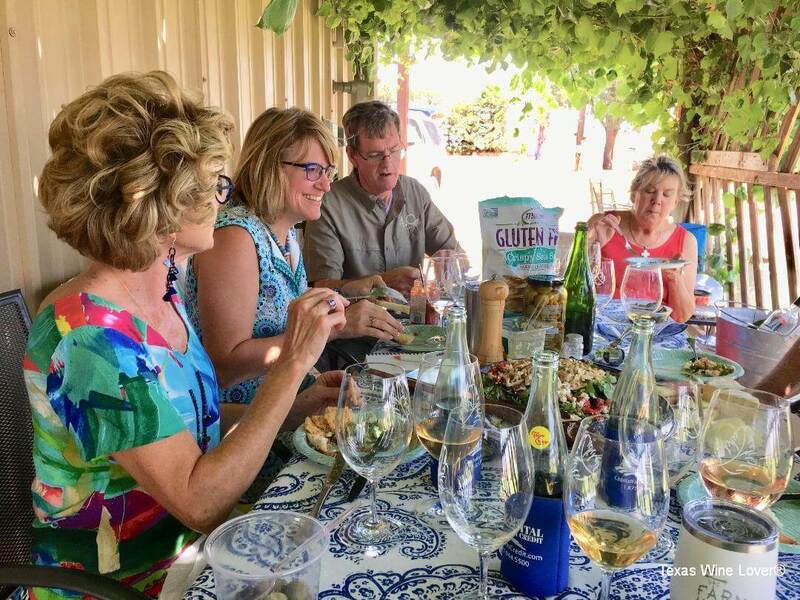 We were to join them, along with Gail and Bill Day, for a picnic lunch under the grape arbor. Once all were gathered, wines were opened and the table was packed with food, including an amazing chicken salad prepared by Jennifer. We visited, sharing wine and food, for well over an hour before moving everything inside to continue snacking and open more wines. Barrels of Cabernet Sauvignon sourced from the Days’ Buena Suerte Vineyards and made by Bobby Cox were stacked in the front tasting room. Bobby pulled samples from several different barrels, American, French, and European, for us to taste. The differences in aromas and flavors due to the different barrel sources were quite notable. Everyone had an opinion as to which they preferred. 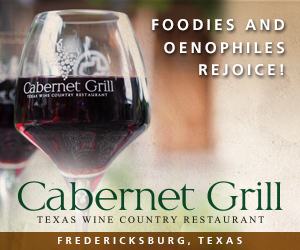 Gail and Bill expressed their hope that the wines would continue to improve, and once blended together, represent a noteworthy Texas High Plains Cabernet Sauvignon. Bobby opened several special wines for us, including a classic 1987 Cabernet Sauvignon, two Bordeaux-style reserve blends (1994 and 1998), and a delicious 2010 Texas High Plains Pinot Noir. It was fun to compare the Texas Pinot Noir to ones from Oregon and Burgundy. Bobby and I restrained ourselves, as much as possible, from launching into a complete wine geek session about Pinot Noir and Burgundy as the rest of our group didn’t seem quite so enthusiastic as we were about the topic. It seemed that no one was really ready for the day to end as a discussion about sharing dinner in Lubbock was initiated. Everyone finally loaded into their vehicles and we followed Gail and Bill Day to a Mexican restaurant on 82nd Street. The cold Mexican beers and Margaritas were a great follow for all the wine we had shared. Even though the food turned out to be somewhat disappointing, the fellowship with friends, stories, and lively discussions were wonderful. Eventually the fun had to end, and everyone said their heartfelt goodbyes. We returned to the Best Western Hotel in Brownfield to get some rest before the long drive back home on Monday morning. 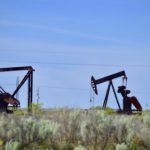 As we drove homeward to the southeast, Laurie, Shelly, and I began to talk about our original plans to stop for a burger ever since we arrived in Brownfield five days ago. Somehow that burger stop never happened. So, Laurie called her Mom in Zephyr and arranged for her to pick up burgers for the group and meet us at Spirit of Texas Winery in Early. After greeting Moira and Brian McCue, proprietors and wonderful hosts at the winery, we opened some wines and finally enjoyed a burger with Laurie’s parents. The burgers were delicious, and it was fun sharing some of our adventures and photos with the group. 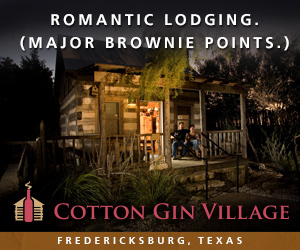 We finally parted ways as Laurie and Shelly moved on to Burleson and I headed to Fredericksburg. 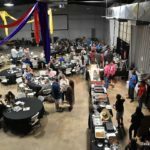 It had been yet another Texas High Plains wine extravaganza filled with fun, friends, and wines. 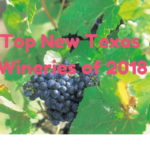 And, all the way home I kept thinking about how important the contributions of those dedicated Texas High Plains grape farmers are to our Texas wine industry and the wonderful Texas wines we enjoy.